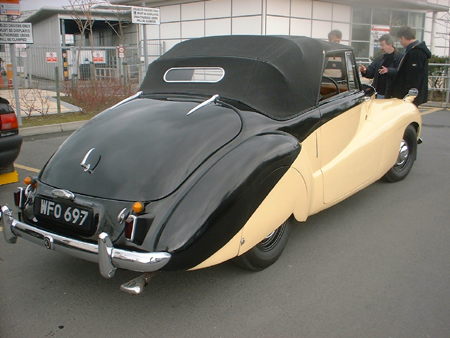 The Daimler Special Sports is based upon the post war DB18 chassis with several important modifications, the most notable being an overdrive gearbox, high ratio differential, hydro/mechanical brakes, alloy cylinder head and twin carburettors. The standard DB18 chassis had built in jacks, an automatic lubrication system and heater as standard, which also feature on this car. The title Special Sports is a misnomer, the car should rightly be regarded as a comfortable high speed touring car. 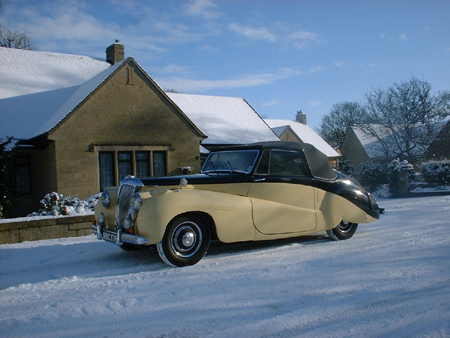 Its seasoned ash frame, heavy upholstered seats, thick Wilton carpet and beautifully crafted wooden trim, give a weight to the car which reduces the effectiveness of the twin carb’s and alloy cylinder head. However the car will comfortably cruise all day at 60mph plus and is easily capable of motorway speeds, (although this is not the best way to enjoy these cars, ‘A’ roads being its natural environment). The Special Sports is also remarkably economical, I have frequently achieved 25+ mpg, an impressive figure for a car of its size. The long wheelbase and excellent suspension, independent at the front, iron out the bumps and give the car a lovely long legged ride. These Daimlers will tour all day and leave the driver and passengers feeling fit and well, I have often covered hundreds of miles in a day. The chassis of the DB18 range rarely give cause for concern, they are built of high grade steel and well engineered – a rotten chassis is most unusual. The 21/2 litre, long stroke, straight six, ohv engine was developed during the 1930s and then tried and tested in the highly successful Daimler ‘Dingo’ Scout Car during the Second World War. The post war engines benefit from inclined valves giving better performance than the pre war model, properly maintained these engines are capable of huge mileages. Smooth and torquey, combined with the epicyclic ‘semi automatic’ self changing gearbox, they suit the style of the more mature driver, boy racers will only be frustrated by the lack of instant acceleration and should steer well clear! 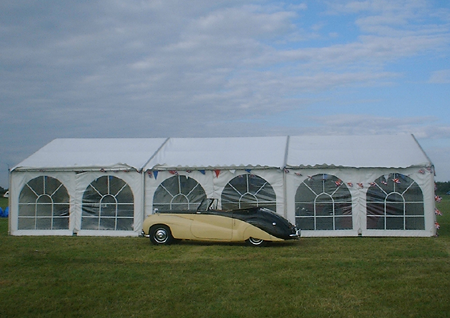 The Barker bodied Special Sports was used in all winds and weathers. The preselector transmission is a delight and this combined with the fluid flywheel, gives the driver and passenger an excellent smooth ride. If you have not driven a fluid drive Daimler, imagine an automatic, but with the ability to change gear when you wish, by first selecting the desired gear and then depressing the gearchange pedal (which is in the position of the clutch in a manual car). The ‘self changing gearbox’ with fluid flywheel has the best attributes of both the fully automatic and the manual systems. Daimler perfected this system and adhered to it for a third of a century, it was expensive to build and the arrival of the full automatic gearboxes killed it off, a shame as it is a truly wonderful system. Every enthusiast should enjoy the experience, it is easy for a novice to use, yet provides the skilled driver with the means to make perfectly smooth gear changes which will give his passengers the illusion that the car is ‘gearless’. 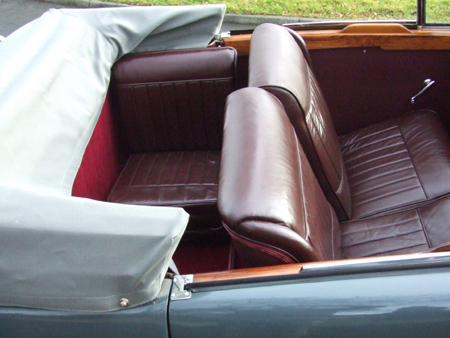 If you like to be noticed and enjoy touring, a Barker Special Sports is an excellent choice, with superb seating and space for 2 adults, with masses of luggage space (the single rear seat is removable) and occasional seating for 4 (the front seats align as a bench and allow for 3 abreast). With the fully lined mohair hood raised, the car feels like a saloon, it is quiet and opulent, highest grade leather, thick woollen carpet and a beautifully sculpted dash, make this a wonderful environment. Hood down the car is still remarkably quiet and really comes into its own, you will find yourself looking for excuses to drive it. 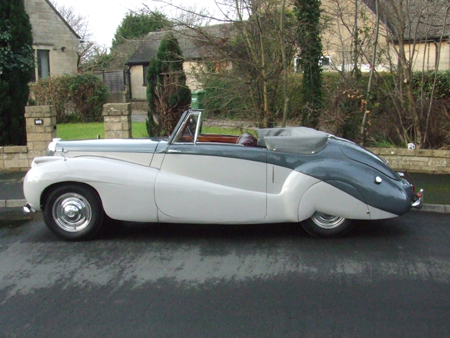 The looks, from any angle compare well with the very best coachbuilt cars of the pre and post war era. A small car for a Daimler but large by comparison to most other marques, the car is easy and pleasant to drive, although steering will feel heavy at parking speeds if you are used to modern power systems. Around 500 of these handsome coupes were built and the known survival rate is surprisingly high, some exceptional cars exist and quite rightly command high prices. Special Sports values have risen steadily over the last fifteen years, yet these lovely cars still represent excellent value for money, buy a good one unless you particularly enjoy restoration, the high quality materials and the traditional methods used in its construction are very expensive to replicate. I have owned several Special Sports over the years and carried out many repair jobs on them, the grey car in the photographs was Daimler’s own press launch car JVC 192, I discovered it in derelict condition in a lock up garage in Essex, the owner, once appraised of its provenance started to renovate the car. 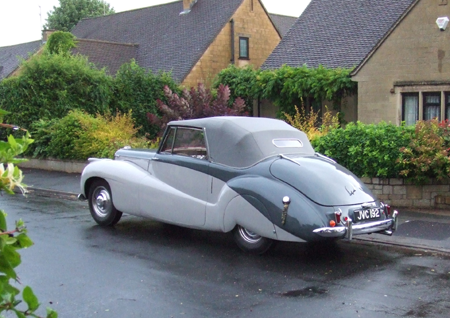 Five years later, I obtained the Daimler, half way through a failed restoration and after performing many repairs, eventually returned it to the road. The engine is well built and will last a lifetime if properly looked after, the most common problem I have experienced, is a cylinder head gasket failure, the alloy head suffers corrosion in the waterways and requires welding to restore its profiles, I have never had one that has been irreparable. Another common problem which is not by any means exclusive to this engine, is a clogged water jacket, fortunately this is easy to rectify. Simply knock out the core plugs and run a slow water hose into the jacket, via the thermostat housing – poke and prod the waterways with a length of wire and be prepared to be amazed at the debris that comes out. If you have to remove the cylinder head, take the opportunity to clean the now easily accessible waterways in the block, time spent on this will pay dividends. 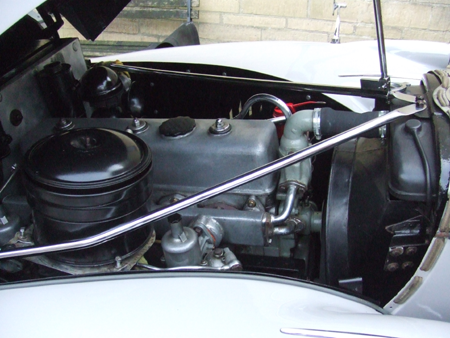 Once the radiator has been reconditioned (do it anyway if the car has been off the road for any length of time), you will never suffer the over heating problems often experienced in old cars. Always use a good antifreeze/corrrosion inhibitor (one that is suitable for older engines), it will prevent the future build up of this debris and protect the valuable alloy head. If the coolant system has not been filled with a good anti freeze mix and the car is left out in a frozen environment, the cylinder block will crack, the split will inevitably occur just below the cylinder head on the manifold side, (I have seen several otherwise good engines damaged in this way). All DB18 chassis are well built and vice free, the Special Sports and its younger brother, the conservatively styled Consort, have a box section extension welded to the front end, on which the bumpers hang, these are prone to rust due to the ingress of road dirt, repair is straightforward and well within the capabilities of an amateur home restorer. All running parts are well built and require no more attention than any quality car of this era. Daimlers of this period have an automatic chassis lubrication system, these are fine whilst in good working order, but failure is only evident when a part seizes, or fails at MOT time. Many cars will have had the system replaced with grease points, this is a perfectly sensible modification and should not detract from the car’s value, however the lubrication reservoir and operating valve should be left in place, it will give the impression that the car still has its original equipment and allow a future keeper to reinstate the system, should they so wish. The gearboxes are tough, the fluid coupling being the weakest point, the central seal will inevitably fail, replacements are cheap and readily available but beware, the engine and/or gearbox has to come out. Differentials are underslung worm drive, they are strong but require proper lubrication, a straight 140 oil, an ‘EP’ type of oil must not be used, it will attack the bronze parts. A broken diff will be expensive to repair and second hand ones are unlikely to be found. Brakes are of the Girling Hydro-mechanical type and are very straightforward to maintain, as are the steering box, wheel bearings and dampers. Track rod ends, steering idler, ‘king pins’ and lower spherical bearings should be carefully examined, failure of the lubrication system can cause all of these to wear at an alarming rate. The rear spring shackles are also automatically lubricated, however I have not experienced problems with these. The rear springs themselves carry a lot of weight and will often require attention, the cars originally sat quite high at the rear, many of them now sit rather low, this is not usually a problem until you fully load the boot and carry a back seat passenger! The body is constructed using aluminium over a seasoned ash frame, with steel front wings and screen surround, the spats are usually (but not always) steel. The doors are a composite, using steel and wood with an alloy skin. Corrosion can occur wherever the alloy meets the steel, the lower steel inner section of the doors and rear wheelarch lip (behind the spats), are places to examine. The high grade alloy is usually in good order, although being softer than steel will dent more readily. Stress cracks may occur in 3 areas; there is a join in the ash frame above the rear wheelarch, in high mileage cars, a crack may appear running from just below the hood straight down towards the centre of the wheelarch, this is not a huge issue on a cheap car and may be TIG welded (drill a hole at the end of the split first – this will prevent it from travelling on after the repair). The 2 other likely trouble spots are on the door top sections, one near the quarter light, the other at the back edge near the chrome trim plate. Any other cracks are likely to be the result of impact damage. 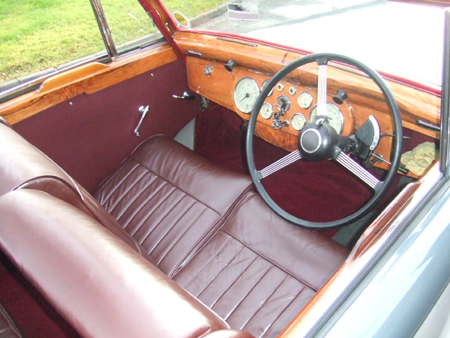 The interior is particularly luxurious, to renovate it to its original, new condition will be expensive, do it ‘on the cheap’ and you will spoil the car, scruffy original is better than compromised modern. The leather, carpets and interior fittings are all hard wearing, the plywood floor, lower door sections and door cards are not, they attract woodworm and the ply de-laminates, beware, this can even occur on otherwise sound examples, incidentally the woodworm finds it difficult to differentiate wood from leather and will wreck the leather door card coverings and seat backs, given half a chance. The front wings rust at the lower trailing edges, headlamp surrounds, sidelamp pods and the several places where securing brackets or splash guards are fitted, the lower ‘corners’ of the screen surround are also vulnerable. The front apron and the adjoining part of the front wings, should also be inspected. Replacement panels are extremely rare, so be prepared to fabricate your own. The high grade ash frame is particularly well constructed and will seldom be rotten unless poor accident repairs have been made, or the car has been neglected and poorly stored. The sill panels are however a weak point, the wooden frames are often rotten but are easily repaired (and of course non structural). Having sold my lovely Special Sports, I am missing it! I am very keen to own an original unmolested Barker Special Sports, scruffy or immaculate, please contact me by completing the form below if you have one you would like to sell.